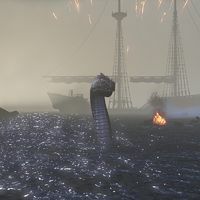 The Sea Serpent is a giant aquatic beast summoned by the Maormer during a fight on the Abecean Sea. It is similar in appearance to a giant snake, but is much larger and cannot be directly fought. It can cause damage by bashing the ship's deck with its tail, and you will need to use ballistae to kill it. This page was last modified on 18 October 2015, at 00:14.